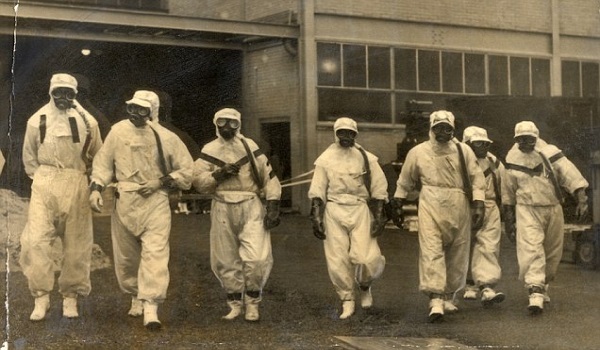 Nuclear firefighters: Workers in protective clothing tackle the blaze at Windscale (later known as Sellafield) in Cumbria in 1957. The 4th reactor at the Chernobyl nuclear power plant, post-explosion. Image on 16 March 2011 of the four damaged reactor buildings at the Fukushima Daiichi Nuclear Power Plant. From right to left: Unit 1,2,3,4. Hydrogen-air explosions occurred in Units 1,3,4 causing the building damage, while a vent in Unit 2’s wall, with water vapor and “steam” clearly visible, preventing a similar explosion. What we can call the Founding Nuclear Disasters have already occurred several times. These included the British Winscale disaster (the site was renamed Sellafield), and the Ukrainian Chernobyl and Japanese Fukushima disasters – each of the second two has cost or will cost hundreds of billions of dollars to manage. Fallout from Chernobyl across Europe led to large numbers of cancer deaths in the 28 years after 1986. But for the moment enough is not enough! Humanity, or at least its elites who think, act and decide for voter sheep, want more nuclear disasters. Nuclear power is “low carbon” and almost independent of fossil fuels; for example the fossil fuels needed to mine and process uranium fuel, and build nuclear power plants, and decommission them, and bring their employees to work each day in their “fuel efficient” sedan cars, and take them home each night on tarmac covered roads – this hardly needs fossil fuels at all! Flying the nuclear sales lobby around the world to give “breathtaking insights” on the all-new reactor designs for the low carbon future hardly needs fossil fuels – but does need rhetoric and hypocrisy. Low carbon, you know! Above all, nuclear power is essential for the production of atomic weapons, either clean or dirty. Nuclear power is provenly good for war! Political leaders and their selected and paid scientific advisers say we have no choice. There is Peak Oil and Global Warming, and in any case it would be much too expensive to give up the atom in several of the 31 countries of the world (out of 193 at the UN General Assembly) which go on using it. When it concerns nuclear disasters, the favorite meme is they can’t ever happen again. Until they happen again. Right now, we can forecast that when the next founding nuclear disaster comes, this will mark great change. It will unleash the era of Heroic Nuclear Adventure. This evening or tomorrow, either rebel forces in Ukraine, or the Kiev “flash mob government” can target and bomb nuclear power plants (NPPs) in their respective enemy’s territory using totally “classic and conventional” high explosive weapons. For example the type of military ordnance used to shoot down Malaysian Airlines flight MH17. Why not? You supply the answer. Subsequently, nuclear energy and weapons experts can ponder the subject of whether or not this was effectively “a fission weapon” or whether it was effectively a giant gamma radiation dirty bomb. We will be so fascinated by their answers! Above all there will be major loss of life and massive economic damage. That is the bottom line. The rhetoric of the nuclear “experts” may be interesting to the intellectually weak and mentally infirm. Little understood by most people, the reality and the truth of nuclear power is almost totally unknown. We are chained like prisoners, and fed shadows, as in Socrates’ and Plato’s cave, instead of truth about nuclear power. If we saw the reality we would be distressed and disoriented. If you or I or the psychopathic killers of ISIS have a few kilograms, say 10 kilograms of plutonium oxide, and the means to spray it in any city center they want – the people will run like insects hit by DDT spray. For ISIS that would be simply splendid! Nuclear disasters are very unforgiving and you have no choice. There will be No Alternative. Do not waste our time denying it. As it is, 1945-style atomic weapons have been mixed and mingled with 1950s and 1960s-vintage weapons technology, and then mixed with later technology, producing a Sorceror’s Apprentice stream of materials and components for fission-type and fusion-type bombs. These can be assembled somewhat like choosing the sauce-and-salad mix for your burger meal. Whether the next nuclear disaster is asymmetric war-type, or simply “a conventional disaster”, what is sure and certain is this will generate paranoia and a surge of anti-nuclear luddism, and anti-state sentiment against the political powers “who let it happen”. Several German historians, sociologists and political scientists compare Germany’s Energiewende program to stop and cease all nuclear power in Germany by 2022, with mass movements of the distant past driven by fear and paranoia. They say it is somewhat like the 19th century reaction of European, American and Russian industrial working classes to the arrival of the machine age. This image, we can note, is also used by nuclear apologists to explain away the natural distrust of atomic energy that most persons feel, on learning only fragments of the reality hidden inside the Doomsday Machine. Moving up to totally-feasible asymmetric nuclear war, destroying NPPs in order to completely release their radiological inventories will bring the reality home. The searing truth following an era of lies and false hopes for nuclear power. An era of childish faith in a technocratic fantasy sometimes called The Peaceful Atom. Long ago, Socrates and Plato invented the Allegory of the Cavern to explain a context where truth is too painful, forcing the average person back into shadowy myths and rationales, to avoid the fear that true knowledge will bring. They said: “Let us suppose that a chained prisoner is freed and permitted to stand up, after a long period of only seeing shadows and distorted images” projected by a small fire on a wall in their prison. If someone were to show the prisoner what had cast the shadows, “he would not recognize them for what they were”. The prisoner would prefer to take the shadows on the wall as more real than what he really sees. We call it cognitive dissonance. Socrates and Plato went on, in their allegory, to another key fact concerning society’s fear of nuclear power. They said “Suppose further that the man was forcibly dragged out of the cave – wouldn’t the man be angry at whoever did this to him?”. The freed prisoner would be disoriented and distressed, and unable to see a single real thing, because he was so addicted to shadows on the wall..
Nuclear power disasters to date should have acclimatized us, but they did not. We preferred not to know – because of fear. In the Socrates and Plato allegory they said that finally the freed prisoner would acclimatize to the real world – not shadows projected on the wall by a small fire. The freed prisoner would end up knowing that the Sun is the source of light, of seasons and time, the steward of all things. In fact the cause of all things. For us, and we will learn this, the only safe nuclear reactor is about 149 million kilometres away from us, and is called the Sun. As Socrates explained, long before we learned the single truth we could play with and intoxicate ourselves with fantasies, or simply be inert and oppressed, and awed by millions of myths, falsehoods, errors, fantasies, lies, nuclear lobby marketing spin, and the babbling of fools and madmen. For too many long decades The Nuclear Fool had the stage to himself – but there is only one truth. The Fool’s NPPs can be wiped out one at a time, or 10 at a time. We are dead. Truth has no opposite, like a photon which has no antiparticle and is in a class of matter or energy all on its own. There can be thousands of nuclear lies, but there is only one Truth. Although they have no mass, most photons are as old as the Universe, and are always traveling forward, like the Truth. They and it will not go away. The big lie – to defend and excuse the production of nuclear weapons – may have seemed endless, to the Oppressed, but that period of time is now terminated. The “peaceful NPPs” were giant dirty bombs and you know it. If or when 10 or more large-sized NPPs and their fuel ponds melted down for any reason – from earthquake and flood through reactor aging and system malfunction to human error and deliberate military attack – this would act out the fantasies of Cold War overkill, the atomic era of Mutually Assured Destruction which lasted at least 40 years leaving indelible fears in society. These fears would become real. Like the most radiation resistant land animals – the lagomorphs (rabbits and hares) – our ruling elites will burrow down in their deep rad-protected bunkers, and any surface speaking venue will firstly be checked out by their loyal servants with a geiger counter, to the extent and for the time that organized society survives and lingers on. Some will recall that the Soviet Union fell apart at least as much through the deathblow of Chernobyl’s incredible costs and loss of life for The Liquidators, as the crazed war the Soviets fought in Afghanistan. Just one maximum credible accident to a single large NPP That was all it took! As we know, the 9 / 11 Terror theater of the absurd did not have “a nuclear handle”, but following any massive asymmetric nuclear war by Islamic terrorists, we can surmize, new Wars of Terror will spring up like mold on rotting food. Political leaders will explain that the spiral of nuclear disasters in the wake of the new founding disaster are sabotage and enemy action. After the diplomatic and then economic sanctions, the process will leapfrog to political conflict, and then military retaliation. As the radiation intensifies, as more regions and tracts of land are contaminated, as the costs and losses rise, the decontamination struggle will be abandoned. This will not be announced, but with time the warning signs, fences and protection barriers of the bad lands will crumble and disappear. More fortunate families will live most of their time underground, with artificial lighting produced from sources of energy that we cannot be too sure about – possibly including solar photocells and windfarms, if they resists the radiation fallout. Human society will increasingly be backlit by shadows in widening numbers of nuclear caves, but nuclear power will not be supplying the lighting. Plato’s cave prisoners were put there by Oppression. Those who will force us out of our nuclear caves will be treated as Oppressors as much as Liberators. But in the end we learned the truth. Nuclear power was the wrong choice. Pop philosophers of the post-disaster era, to be provocative, will say there was socio-technological regression and now is the time for technological advance: to nuclear power. They will move on to the founding stones of our existence, our culture’s preservation through oral transmission, the guardianship of archives by saintly and low paid persons, by priests and monks, who keep the relics of past society, before the intense cultural degeneration which followed the founding nuclear disaster. To be sure, after the disaster, new religions will flourish because religion itself was mutated by the disaster. As in “A Canticle For Leibowitz” (Walter M. Miller) “doctrinal floraison” will be rampant in the former religions called “Of The Book”. These doctrinal and thematic elements will print direct to survivors in the nuclear caves, structuring their daily struggle to survive in an endless and timeless post-disaster story. The growth economy will be another forlorn and distant memory, itself mythologized and fantasized, like the early black-and-white TV images of the atomic age. When we have the patience – or the courage to listen – the myths and lies of nuclear power apologists are similar to particle-antiparticle twosomes. They are “false”, because they will annihilate each other if they meet and whenever they meet. They cannot coexist. Two lies totally cancel each other out leaving a void behind. Human beings fear the void. The lies do not produce truth but produce: nothing. When the next founding nuclear disaster arrives it will produce: nothing. The beguiling lies of the atomic priesthood, of something for nothing will be as absent and as empty as the President’s office, now bunkerized and located deep in a boron and lead walled cocoon. Of course only while the charade of presidential rule lingers on. Human beings fear and shun the void and also shun nothingness. Life and death are seen as asymmetric pairs, or something and nothing, but after the founding nuclear disaster our mental struggle will take place in the backlit cavern of Socrates and Plato. Take atomic particles: these strange things are way over 99.999 percent empty and free of any matter, and can have a half-life vastly longer than the age of the Universe, let alone our Local Galaxy (the Milky Way). One Exa year or Ea (for exa-annum) equals 10 to the power 18 years, and the half-life of Tungsten-180 is about 1.75 Ea, the same tungsten you could have in your bicycle’s frame, or maybe in a bone implant. It comes from a time long before the Big Bang (supposedly a minuscule fraction of 1 Ea before today). From a time long before, like the Truth. According to scientifically correct theory all atoms are made from quarks which depend on time to avoid the finality of wipeout from matter-antimatter duality. Following any nuclear disaster the kneejerk reaction of the nuclear elite is always to play for time, hoping that real truth can be palmed off as what we call a “partial truth” or a “provisional truth”, able to be denied or qualified later on. To make it operational and able to be used to keep the nuclear party going. The Earth is large, even if today in 2011 the arithmetic average of arable land per person on the planet is only 0.2 hectares. We are rich and generous. We can offer ourselves more Total Exclusion Zones like the Japanese-style Fukushima total exclusion zone or the Chernobyl-style exclusion zone – a vast new Nature Park in Europe! The tourists come, with their hand-held geiger counters. Sterilized for centuries, maybe 400 years, these no-go poisoned Bad Lands are strange nature parks with mutant animals and plants supposedly obeying an enhanced and accelerated version of Darwinism. The Founding Disaster, however, will completely destroy 10 or more NPPs. The exclusion zones will total much more than 10 000 square kilometres, perhaps sterilizing several large cities, creating a chain reaction of economic, social, political and geopolitical impacts, and generating worldwide ecological and environmental damage, like the Fukushima disaster’s polluting effects across the Pacific ocean, the world’s largest ocean. Depending on the quick-myths built and scattered by the official media in their ritual damage limiting operations , the spin will quickly shift to identifying the aggressors. Somebody was to blame! The generous phase or interval did not last long According to future historians examining this key moment in human history, within about 7 years from the FND or Founding Nuclear Disaster it had transformed the nation states that we knew today. Outside the TEZ or Total Exclusion Zones, under chaotic and anarchic Martial Law in the dying nation states, the disasters generated a wall of myth and legend. It was still impossible to learn the truth. A million theories, and the single truth were heroically locked in combat as in the early days of the nuclear state. The nuclear maze had walls that were thick and high, like the walls of New Jerusalem but the ladders, tunnels and night-vision equipment of the truth were at work. Avatars of this were on scene even today, in the time before. As in the early heroic age of the atom, in the 1950s and 1960s when MAD was the last word in US-Soviet relations, it was estimated that an attack on U.S. population centers by 100 weapons of only one-megaton yield each could kill about 20 percent of the total population instantly through blast, heat, gamma radiation, ground shock, and other effects. To be sure, national and local power transmission and distribution systems were heavily damaged, leaving the undamaged NPPs in a very fragile condition. With the founding disaster we found that a few NPPs contained as much radiation as a thousand atom bombs equal in power to Hiroshima’s Little Boy that razed parts of the city on August 6, 1945. Nuclear Winter is well described as a theoretical construct. This is global cooling, not warming. The economic shock of the founding nuclear disasters will certainly lead to a major fall in fossil fuel burning by human beings. Quite soon, the climatic and environmental impacts of the silent nuclear war will begin to manifest. Our ignorance, and that of our nuclear experts, will shine like dim and ancient burnt-out stars, pulsing the message that we didn’t know. Before the founding nuclear disasters, nuclear war was at least partly admitted as possible, but serial damage and meltdown to NPPs – for any cause or reason – was totally denied as being possible by the high priests of the nuclear system. But as the nation states fall apart, an eruption of sabotage attacks will lay waste to ever-more NPPs, fuel storage centres, and nuclear waste sites further spreading the Founding Nuclear Disasters. We had an heroic samurai quest as the backdrop to the race to possess the bomb in the 1950s and 1960s by the 5 present-day UN Security Council permanent members- the Declatred Nuclear Powers. It was an historical spy/sci-fi drama with a single goal – get the bomb. Now we have vastly more dangerous Dirty Bomb NPPs stationed in 31 countries, and nuclear wastes that are literally dumped anywhere on the planet. The Nuclear Lobby’s quest was to enable us all to die in ignominy. When we know this truth we can move out of the cave, but if we go on believing the Nuclear Lobby’s lies which are flit across the cave’s wall we will be condemned to a very dangerous future. EBOLA: Natural, Psy-Op or Another 9/11?